Accelerated Universities: Ideas and Money Combine to Build Academic Excellence with Philip G. Altbach, Jamil Salmi & Isak Froumin, published by Brill/Sense in 2018. This book presents case studies of eight universities that rose to international prominence within a short time after their founding. Recruiting International Students in The AACRAO International Guide: A Resource for International Education Professionals published by the American Association of Collegiate Registrars and Admissions Officers in 2016. Edited by Alma Maldonado-Maldonado and Roberta Malee Bassett and published in 2014, The Forefront of International Higher Education is a tribute to the scholarship of Philip Altbach. My chapter,”Redefining Academic Mobility: From the Pursuit of Scholarship to the Pursuit of Revenue,” is a collaboration with Laura E. Rumbley and tracks the motivations and changing patterns of international student mobility during recent decades. 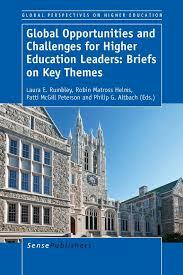 Global Opportunities and Challenges for Higher Education Leaders: Briefs on Key Themes (2014) was edited by Laura E. Rumbley, Robin Matross Helms, Patti McGill Peterson and Philip G. Altbach. The books is based on a series of “Briefs” on international activity in different regions and critical issues that shape initiatives. This project is an ongoing collaboration between the American Council on Education and the Center for International Higher Education at Boston College. My chapter, “Pursuing Partnerships in Argentina,” addresses the opportunities and challenges of collaborations with this country. 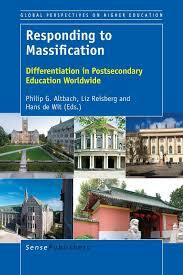 Responding to Massification: Differentiation in Postsecondary Education Worldwide edited with Philip G. Altbach & Has de Wit, published by Sense Publishers in 2017. This book examines the experiences and challenges of 13 countries in five regions as each higher education system expanded to accommodate greater participation. Published in 2012, Paying the Professoriate reflects the work of a multi-national research team with participation from 28 countries. The commentary and data provided here offers the first international comparison of academic salaries and contracts. The book is an important resource for scholars and policymakers. I helped coordinate the research and co-edited the book along with Philip G. Altbach, Maria Yudkevich, Gregory Androushchak, and Iván Pacheco. Today’s academic revolution is unprecedented. Mass higher education has become a worldwide phenomenon, with enrollments growing from 100 million to 150 million in just a decade. The implications of massification are immense—greatly increased participation for a more diverse population including women and many traditionally underrepresented socio-economic groups; the rise of private higher education; diversification of academic institutions; and many more. Trends in Global Higher Education (2010) has been widely referenced. I co-authored this book for the 2009 UNESCO World Conference on Higher Education with Philip Altbach and Laura Rumbley. The World View is a collaboration with the Center for International Higher Education and Inside Higher Ed. I co-edit and contribute to The World View, a blog about key issues in higher education in Inside Higher Ed. My recemt posts can be read by clicking here.